Eu-Gene Ang is convinced about one thing: customer buying decision today are based on emotions backed up by logic. This has major consequences for marketing and advertising. AdAsia met Eu-Gene recently for a Q&A. AdAsia: How would you describe yourself? Eu-Gene Ang: I’ve been 23 years in sales and marketing of which 15 years in a corporate environment. The last 8 years I spent primarily in digital marketing and training. Today I combine a variety of roles and responsibilities as an expert and teacher in the field of digital marketing. I have an exclusive partnership with Econsultancy in Singapore and I deliver their programmes and expertise via Click Academy, a training institute that I founded. Econsultancy originates from the UK and has an office in New York as well. They deliver consultancy services, training and events. It is during one of these trainings, delivered by Allein Moore by the way that I learned about AdAsia. Secondly I am a certified Google trainer for Google Adwards, Analytics and Youtube. Thirdly I am an adjunct professor at the NUS in Singapore for the MBA programme on the topic of digital marketing. AdAsia: What has changed in marketing in the past 23 years? Eu-Gene Ang: Very simple; consumer behaviour has changed completely because of digitisation. Customers changed the way they discover, evaluate and share their experience throughout the buying process. This in turn has fundamentally changed the way brands and products should market and advertise their products and services. AdAsia: So do brands get it and are they transforming their marketing strategy? Eu-Gene Ang: Most brands by now understand that change is needed but still think and approach in a very classic advertising way. Just a few started to address the necessary changes in marketing strategy. Just looking at the Adex indicator shows you that there is room for improvement. Compared to the UK where the Adex is 50% digital, Asia is still behind. Adex in Singapore is 10% digital where Australia leads in APAC with 36% going to digital in 2014. But also China and even Korea are behind compared to Australia and the UK. One of the most promising countries is Indonesia where brands need to realise that marketing and advertising there is primarily on mobile. AdAsia: You also are very adamant about the potential of e-commerce and not only in Asia. What is your opinion on this? Eu-Gene Ang: I noticed that many people don’t realise that e-commerce still represents only a fraction of the overall retail sales volume. Even in the most advanced e-commerce countries like the US the online sales are only at 8.6% of the total retail sales volume. In Singapore this is 1%. Some transactions will never go online, like buying petrol but there are still a great many areas that will be changed by e-commerce. So there is still room for massive growth, specifically in Asia. Yet the physical experience, i.e. the retail stores will never completely go away. Some good simply need to be tried and experienced before you buy them. But retail will have to change and embrace e-commerce as an integral part of their business model. AdAsia: What is your vision on omni-channel marketing? Eu-Gene Ang: Omni-channel is a mission. It is the ultimate goal beyond cross- and multi-channel marketing. Brands should thrive for a completely personalised journey from online to the store. Marks & Spencers virtual furniture experience is an excellent example of a retail store that got their act together. Audi’s virtual showroom is another one. AdAsia: Investments in martec increase and every company will want to calculate ROI. But due to the complexity and the vast impact of marketing automation, this is also harder to calculate. What is your opinion on this? Eu-Gene Ang: In today’s environment where we cope with a constant information overload, brands have to create emotions in order to be relevant. This is a long term strategy so there are not necessarily immediate returns on investment. Asking for ROI is also the wrong question if you connect it with just the P&L. Marketing investment should be a balance sheet item. It should create and build brand equity. It is a difficult topic though but the C-level has to understand that in some cases the investment can only be justified against a brand equity background. AdAsia: Your favourite statement is: people buy by emotion and justified by logic. Can you explain this principle? Eu-Gene Ang: As I said before, there is simply too much information around us and human beings have difficulty handling that. There are zeta bytes of information available to us. The amount of information we process during a purchase has doubled. Secondly there is increased time pressure and we are constantly multitasking while navigating through the day. A typical example is the purchase of a new smartphone. Most of us will gather information by going online, talking and sharing with friends and visiting stores. Where you may have a rough idea about two or three brands or models in the beginning, once you start doing your research, most of us get more confused. The purchase is then more often than not emotional. It is what Google calls the zero moment of truth. If your brand is absent or incorrectly perceived at the ZMOT, you will not be bought. Once you have bought something ‘by emotion’, you start justifying it after the purchase by logical thinking. This logic is not necessarily the absolute truth but these are thoughts like: ‘I deserve this phone because I worked hard for it’. It is also to necessary for marketers to look at the McKinsey consumer decision model. 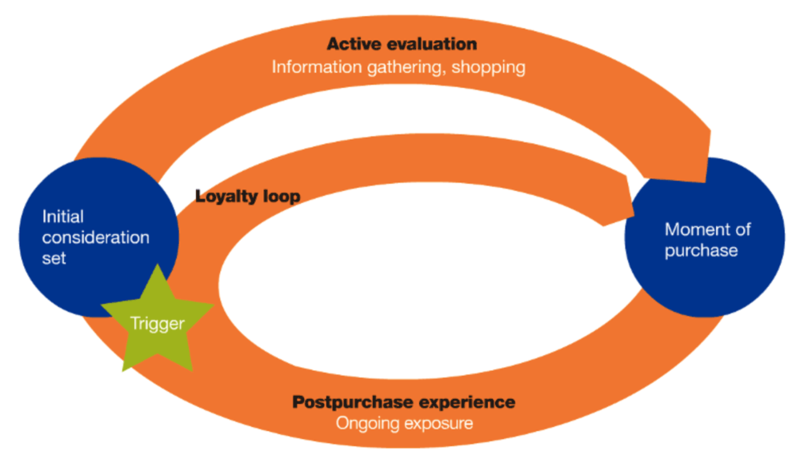 AdAsia: What are the marketing tactics that support this process the best way? Eu-Gene Ang: The most important tactic is content marketing. It helps building trust which is a primary decision driver for consumers in both B2B and B2C. This in turn should be the basis for your decision making about martec expenditure. You should have video capabilities e.g. because that is a content format of growing importance. In the product life cycle it is content marketing that can help the brand recall and ensure that you stay top of mind. Content can help the brand engagement as well. AdAsia: So branding is of growing importance? Eu-Gene Ang: Absolutely, consumers buy your brands that clearly have a purpose. AdAsia: Our last question for this session; what do you think about the increasing complexity of the martec landscape? (2.) There will be room for scams and fraud, which we see already happening in the online banner space. Google is fighting ad fraud actively as it is estimated that currently $6.3 billion dollar in digital advertising is wasted. There are also suppliers that overpromise and under deliver or go out of business. (3.) Finally, I am beginning to hear marketers saying that they have the feeling that they are losing control because martec in some instances is taking over and remains a black box to them. AdAsia thanks Eu-Gene Ang for taking the time for this Q&A session and we hope to meet him again soon and often during events and seminars across APAC.